A recent survey found that nearly 80 percent of Syracuse University instructors use the feedback they get from student ratings to revise their courses. 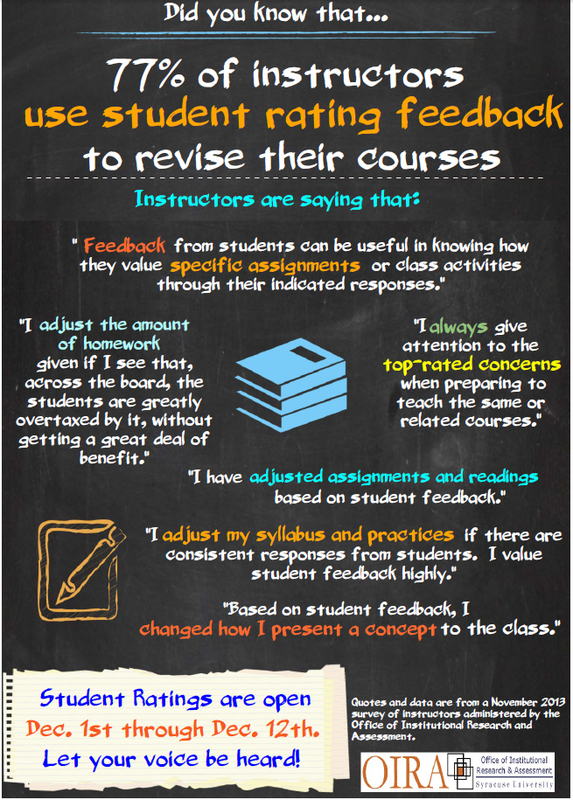 Faculty members in the survey described how they have added or removed topics, adopted new ways of teaching, revised assignments and modified exams in their courses in response to feedback they got from students. Your instructors are listening to what you have to say about their courses. But they can only respond if you let them know what you think. The online system for student ratings will open on Monday, Dec. 1.You will receive an e-mail that day that contains your passcode for the system and the link to the student rating website (http://aaf-ratings.syr.edu/). It will remain open until Dec. 12. Most departments use the online system for collecting student ratings. 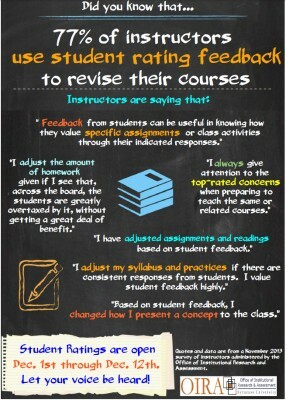 If you do not see a course on your online student ratings page, the course may be using paper evaluations. Paper evaluations will be administered in class, typically at the last class meeting. If you have a question about how student ratings will be collected for a course, check with your instructor. Questions should be directed to the Office of Institutional Research and Assessment at oira@syr.edu or 315-443-8700. Thank you in advance for taking the time to let your instructors and the University know about your classroom experiences.